Last week was Shark Week. 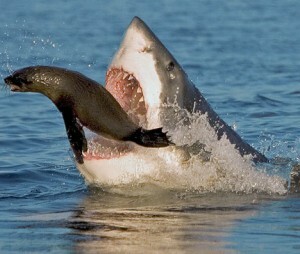 Those close to me know I have a seriously morbid obsession with sharks. Like so many of us, it goes back to the movie, Jaws. I think I was around 12 years old when the movie hit the theaters. I’ll never forget how I nearly hit the ceiling when that head popped out from under the boat. It’s akin to the Kramer painting: I find it offensive, loathsome and disgusting, yet I can’t look away. Even today, when the movie comes on some cable channel, I’ll stop what I am doing and sit down for the remainder of the show. Sadly, over the years my morbid obsession has morphed into a mantra; Stay Out Of The Water. People pee in swimming pools (Mike & Mike in the Morning on ESPN last week); there are things in fresh water bodies of water with huge claws and teeth (think northern pike on HgH); and there are sharks in the ocean. People on these shows are begging to be attacked! 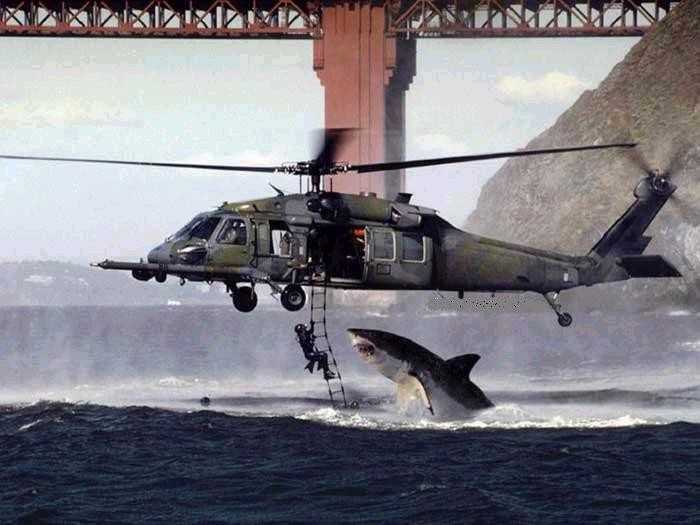 Stay the f$#@ out of the water. But I digress. Saturday found us racer types at the 6th Annual Mass. Avenue Criterium. 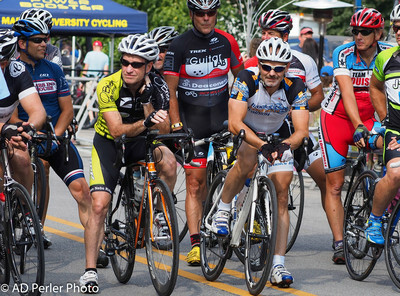 The race has become the preimier cycling event in Indiana. This year the organizers raised the bar several notches with street lights and night time racing, along with inovative technological advances. The races were streamed live to 12 flat screens along Mass. Ave. and also to smart phones. Big kudos to the announcer, John Gatch, as well. His enthusiasm entertained the large crowds and kept the racers well informed of the strategic situation on course; perhaps a little too informed in some cases – uh hum. You could say the Mass Ave. course is shaped like a shark’s tooth, what with it’s triangle course and two greater (or lesser, depending on how you look at it) than 90 degree turns (shark sharp), not to mention the numerous pot holes, sewer grates and rough spots that simulate the serrated edges of a shark’s tooth, scattered about the course. So given all of the shark shinola, fate decided to taunt me with the ultimate shark image – snatching defeat from the jaws of victory. 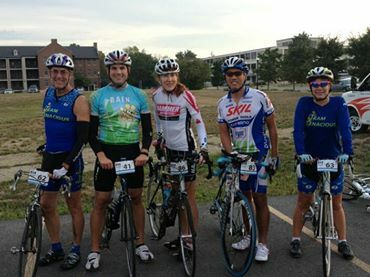 A huge crowd including several friends were on hand for the 22 or so of us in the Masters 50+ race. Damian Maggoos of Heroes was the early aggressor, attacking 2 or 3 times within the first couple of laps. 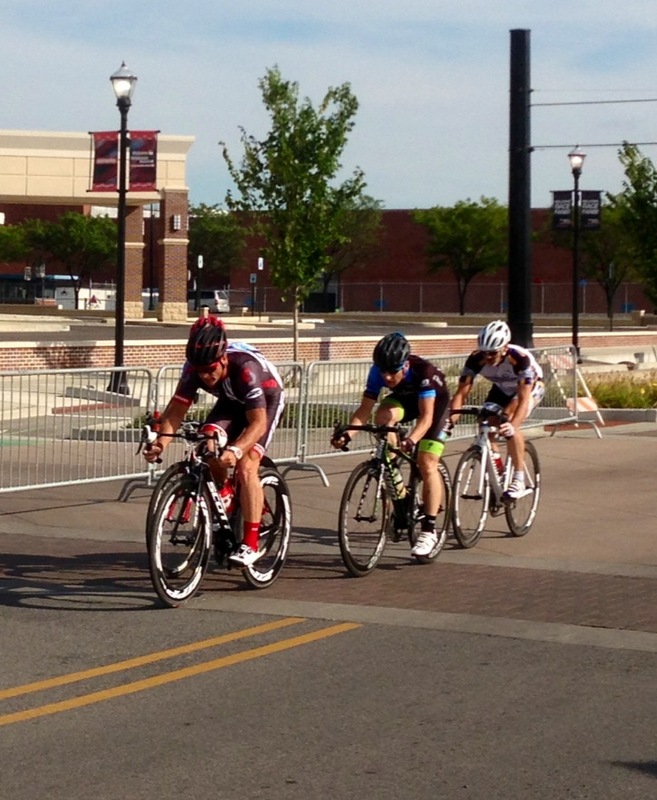 Matthew Grate of Men of Steel Racing took up the action with an attack, followed by a couple more aggressors. A lap of respite ensued and then pre-race heavy favorite, John Schmitz of Indie bike took a big dig, opening a 7 second gap on the field. I laid back to this point, hoping to preserve as many matches as possible for the 40+ race at 8 pm. Normally, I’d not hold back because most 40+ races are only the usual 45 or 50 minutes long, but Saturday’s 40+ was a Megaladon-esque 70 minutes. I could feel the jaws of three-intervals-per-lap biting into my quads already. But here’s the rub; we are wired to attack. Like a shark, it’s instinct after you’ve been doing this for a while. 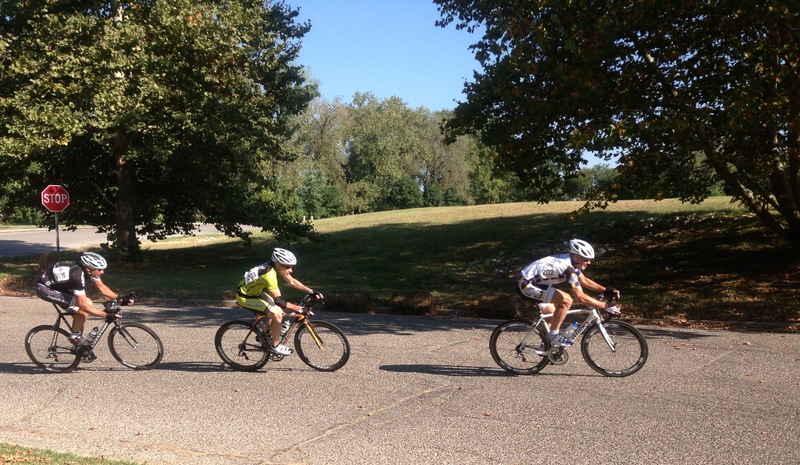 As the group closed in on Schmitz I could sense the pack fatiguing from the early hot pace. As Dr. Wilkes likes to say, ‘there was blood in the water.’ And so as we caught John, I countered. I hoped someone would go with me, but no one did. My gap widened and my mind started in: ‘Man, I did not want to expend this much energy in this race when I have another 70 minutes looming.’ Even so, I carried on building my lead lap after lap, eventually staying out front for at least a third, maybe half of the race. About this time the announcer began calling that Schmitz was on the attack, hoping to bridge. I eased slightly, hoping Schmitz could latch on unattended. Nope. The group was too cagey to let two of us get away together. My better option was to hold focus on the moment and forget about the later race, forgoing any easing up and just doing it on my own. 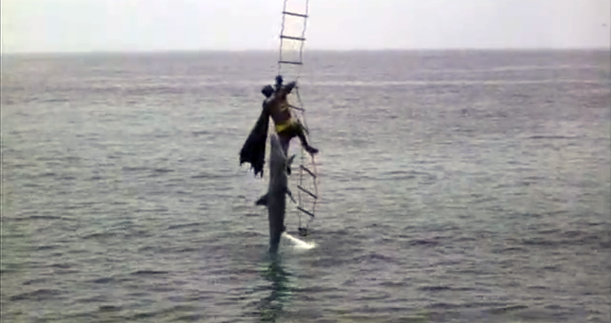 As it was, the group came back together with 10 laps to go and now the shark had me where he wanted me – fatigued. At 5 laps to go a small group broke clear of the pack, but neither myself or Schmitz made the effort to join them so they ran free for a couple of laps. At three to go the pack took up the chase and had two of the three re captured as we began the bell lap. Matthew Grate dangled off the front through turn 1 and through turn 2. As I came out of turn 2 Grate still held a considerable lead so I had to jump then. From turn 2 it’s 600 or more meters to the finish line. The shark in the form of jim Creamer, latched onto me, poised for the kill. I caught the lone rider approaching turn 3 and had to slow for him as he did not handle the turn very well, and then I had to reaccelerate into the home stretch. Creamer tucked in and slipped by in the final 5 meters. It was agonizing to lose the race after having it firmly in my jaws (hand). Yet if I had to get beat, better it be by a guy who I introduced the sport to and to a guy who happens to share the same birthday as me. Jim came to the bike shop where I was conducting winter training classes for the 09-10 winter training season. I encouraged he and his daughter to sign up. Both Jim and his daughter exhibited natural athleticism and I could tell Jim would take to the sport. Over these few years Jim made huge strides and upgraded to Category 2 at the end of last season. Always with a smile and a positive word, Jim’s an all around good guy; a worthy State Champion. I was fortunate to have many friends on hand, as evidenced by some of the photos. On that note, I’ve included several photos in this post because I am blessed to have two friends who take professional quality photos; Scott Brooks and Adam Perler. Thank you very much, guys, for the wonderful collection. You guys are jawesome. 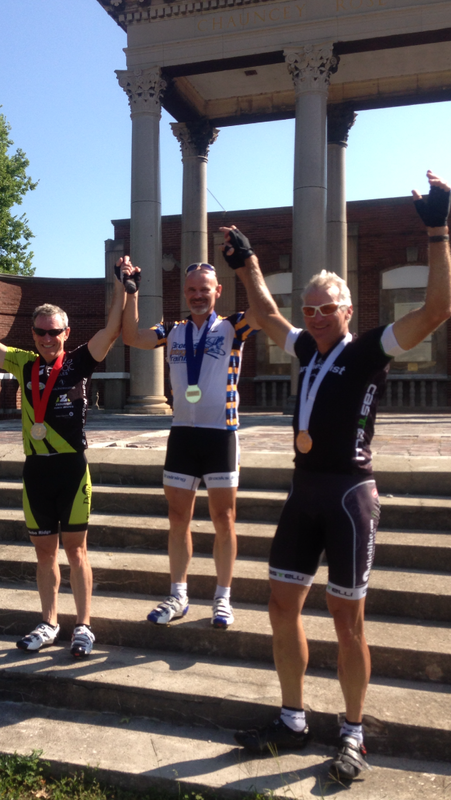 After the race we celebrated the podium, which also included Brad Demott, otherwise known as Fast Freddie. 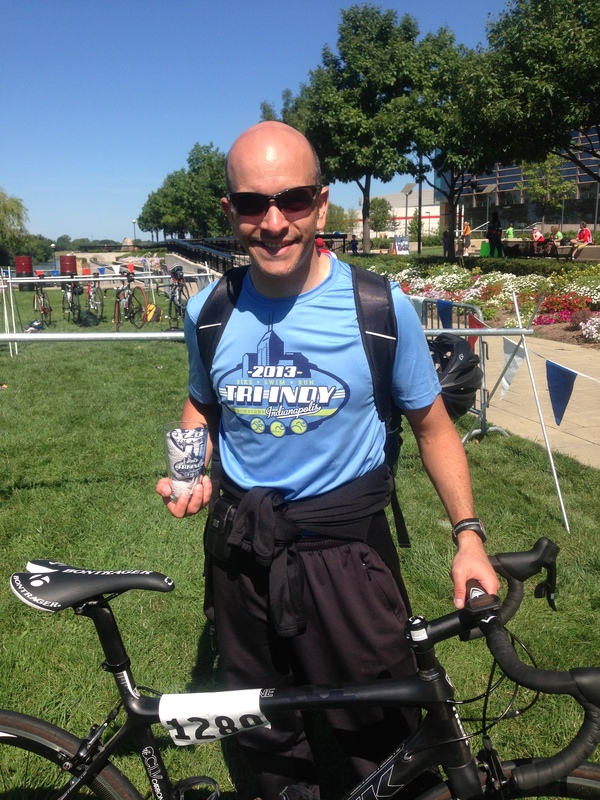 Brad manages Gray Goat Cycling on the south side and earlier this year he really helped me out when I was in a bind. My old wheels were way out of true, especially the rear wheel. My normal resources were busy, so I called Brad and asked for help. He told me to come on down and he’d true the wheels up for me. I am grateful and I highly recommend south siders visit his shop on S. SR 135. 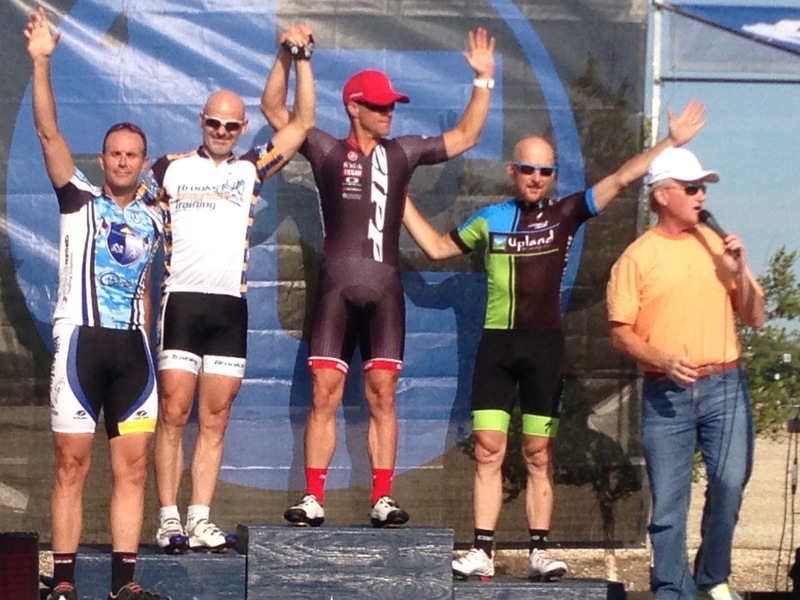 After the podium celebration it was time to get ready for the Megaladon, 40+ race. Although it was tempting to skip it and begin drinking beer with friends, the bite of defeat was too strong to ignore. I was determined to give a good effort in the second race. With twice the field size and legs 10 years younger (not to mention fresher) the pace was blistering from the start. 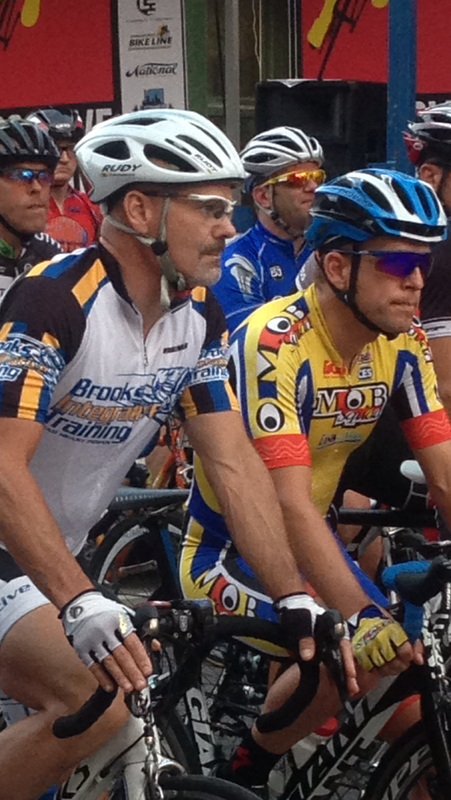 In the first race I happend to be parked next to Jim Creamer at the start line. As I took the line for race #2, I lined up next to Court Maple. As you can see in the photo below, Court was very intense before the race. He looked like he was ready to devour something or someone, although he did offer a fist bump with me just before we took off. This is purely speculation, but I suspect Court had some payback to give. 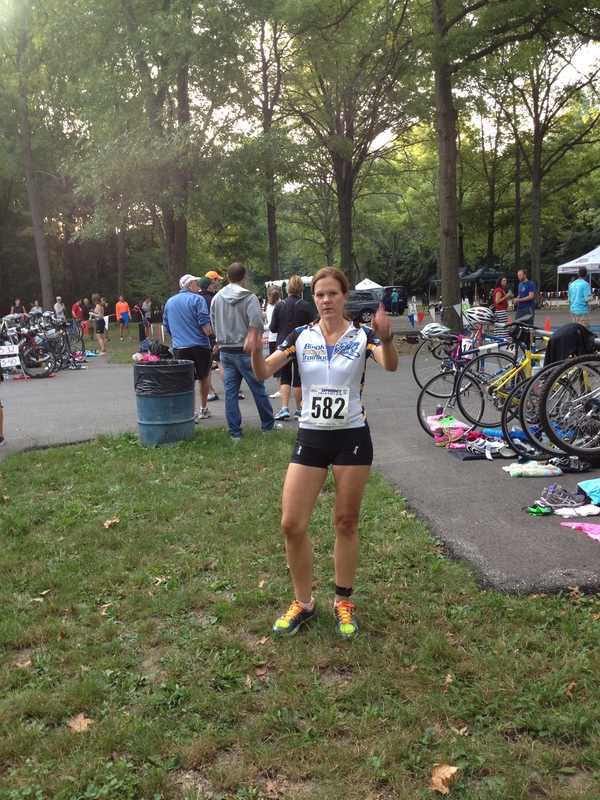 At the State RR a few weeks ago, Court raced in the 35+ category that mixed in with the 45+ and the 55+. 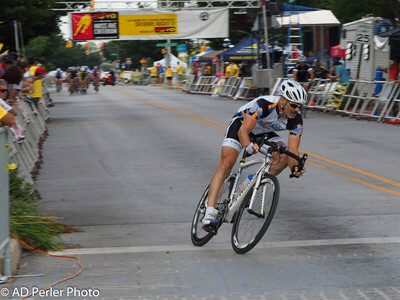 Court established a break away with 4 other riders, all of whom were in the 45+ category. I am told that Court did most of the work, knowing he was the only one in his category, having secured victory by default. After five blistering laps we were offered a prime. 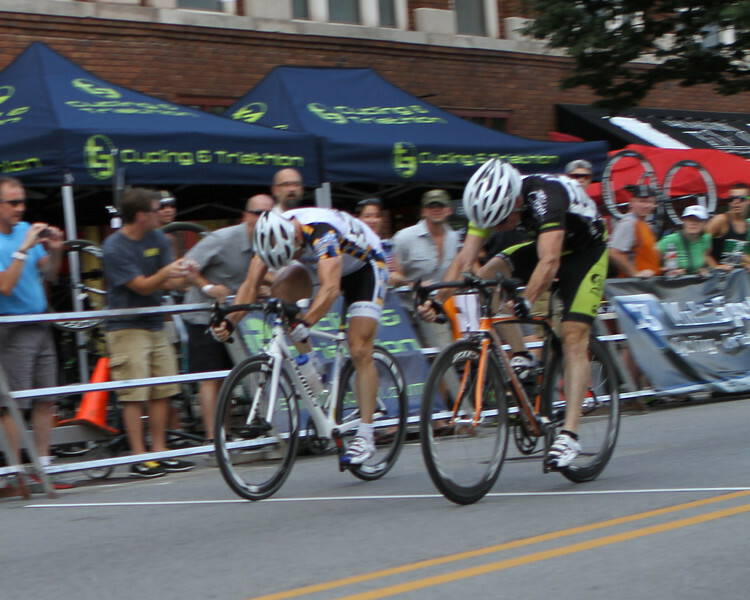 The 3rd place finisher in the state road race claimed the prime and Court jumped immediately after the prime. Being the only rider in position to go with Court, 3rd place went with Court and lasted perhaps 2 laps before being summarily dropped back to the group. Court was on fire. He grew his gap to 18 seconds but with the the dropped rider back in the fold, the one team with multiple riders in the race took up the chase. Smelling blood in the water, other riders joined the chase and Court was reeled in after and extensive effort. So Court merely did what champions do; he attacked again straight away. Micah Fritzinger, Ben weaver and Tom Cox broke clear of the group and remained with Court for 20 minutes or so, putting us this point at 40 minutes into the race. One of the trio was unable to contribute as much to the break as the rest of the group and when Court sensed the weaker rider on his wheel, he attacked again. The other two hesitated and that was it. Game over. Court was gone, flying around the course as if possessed. Court’s lead grew steadily over the final 25 minutes of the race such that he lapped what was left of the main field at five laps to go. And not only did he lap us, he also went straight to the front and drove us around the course over the final 5 laps. Prior to Court’s capturing the main field, two other riders broke free, leaving Court + 5 others in front of the dwindling field. We were racing for 7th place. My own race was a labor. The first race had taken quite a bit out of me. At the 35 minute mark of this one I was not sure I would be able to finish, yet that biting defeat drove me onward. My legs strained with each acceleration out of turn 1. Believe it or not, despite doing 2 races, I thought prior to Saturday that the longer, 70 minute race would favor me because this age group normally does not race that long. I’ve doubled up, often back to back, a number of times this year, so I felt a longer race would wear down the guys who were not used to racing that long. As we drew nearer and nearer the finish I sensed that I was gaining an advantage over several riders. When Court lapped us and took the front, the pace ratcheted up a notch and I found myself 3rd wheel, an almost perfect spot for the end of the race. Court’s driving pace kept the field strung out over the final five laps, with him acquiesing the lead only as we approached the final turn on the last lap. Entering the final turn at #2 wheel was good and bad. The rider leading did not take the turn so well, causing me to slow slightly before re accelerating out of the turn to sprint for the finish. All the way down the finish stretch I held the lead, yet wondered, when are they gonna come rushing by me. As I approached the line I fleetingly thought, O.M.G., I’m gonna get the field sprint. 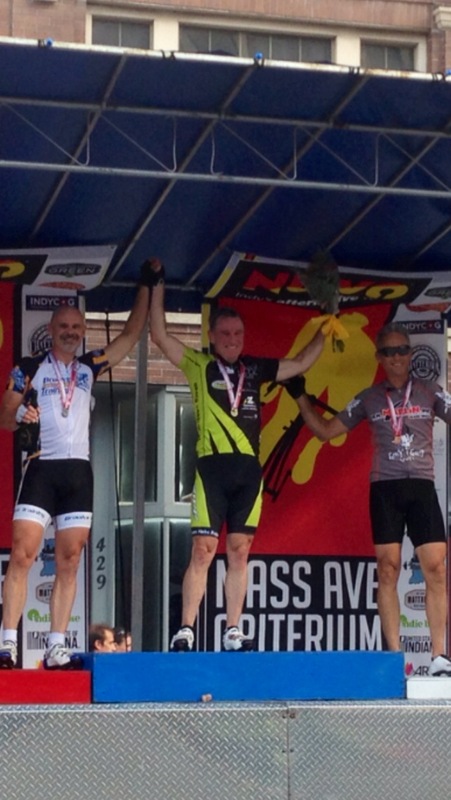 And then, just like the previous race, not one, but two riders pipped by me right at the line. Harry Clark took the field sprint for 7th. 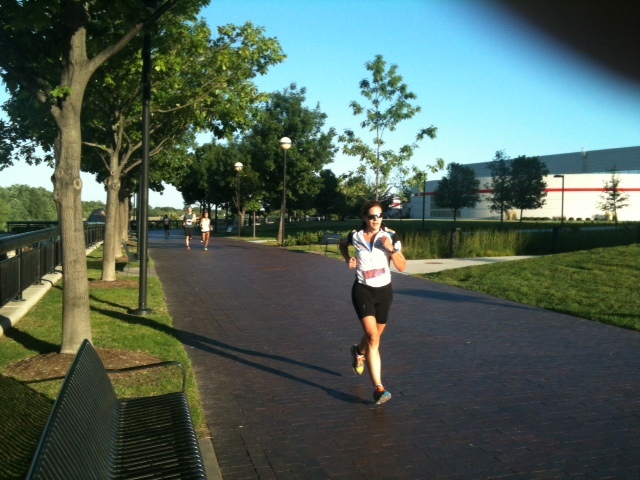 I held on to finish 9th on old and tired legs. Court cruised in behind us, arms extended in Victory. The three riders Court dislodged at the 40 minute mark hung on the battle for 2nd with Fritzinger claiming the silver and Ben Weaver taking 3rd place. Congrats to both Jim and Court. Tip to everyone else for the remaining races; stand next to me on the start line. I don’t often start on the front row, but when I do, I stand next to winners. Stay victorious, my friends. Those of you who regularly attend my training classes know that one of my mottos is: Running is the spawn of the devil. Of course, I say this facetiously, chiding those runners in the class to put more time on their bikes for better cycling performance. I know running, or any other cardio exercise is good for health and wellness. Running seems to be one of the easiest ways to get back in shape; all it takes is a pair of running shoes, some shorts and a little determination. Stride by stride, one improves. Yet on the flip side, many of us have run so much that our bodies have broken down with fractured hips, severely strained IT bands, bad low backs, or any number of other ailments such that cycling has become the go-to activity. And this is where my spawn of the devil chiding comes in. Run if you must, but ride that bike for overall wellness and enjoyment. It seems the Devil’s furnace has been turned off this summer so he’s been whispering in many ears to break out the running sneakers of late. B.I.T. athletes have heard the siren call, hitting the trails and pavement in force this weekend, and posting fantastic results, to boot (really, did he just use a foot pun?). Matt Jordan and Planet Adventure hosted the 4th Annual Eagle Creek Trail Marathon on Saturday, just west of Eagle Creek Park. The event catered to runners of all abilities with the following categories: 5K, 1/4 marathon, 1/2 marathon and Full Marathon. Friday night’s rain sullied the course, making for slick and much slower conditions, however, the angel on my right shoulder grinned with approval, for the soft course meant less pounding on those fragile legs. Deb DuBois, Cristal Garrison and Mike Garrison represented the B.I.T. crew in fine fashion. 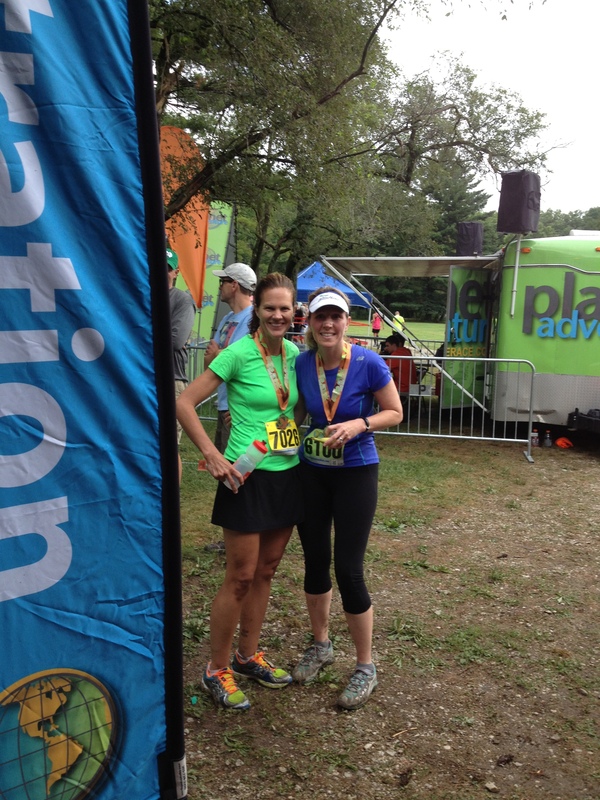 Deb WON her age group in the 1/4 marathon. She said the first two miles were fabulous as she bounded over logs and branches. After that, each log was a welcome respite to stop, slowly slide over, and then resume the running, which took one hour, 12 minutes and 53 seconds. Ouch. Not one to mess about with these minimalist workouts, Mike Garrison traversed the full marathon in 4 hours and 55 minutes. One can only imagine what the devil may have been saying to Mike to induce him to run for so long. Mike was not available for a photo at the conclusion of his run. We in the B.I.T community are known to enjoy our beer. 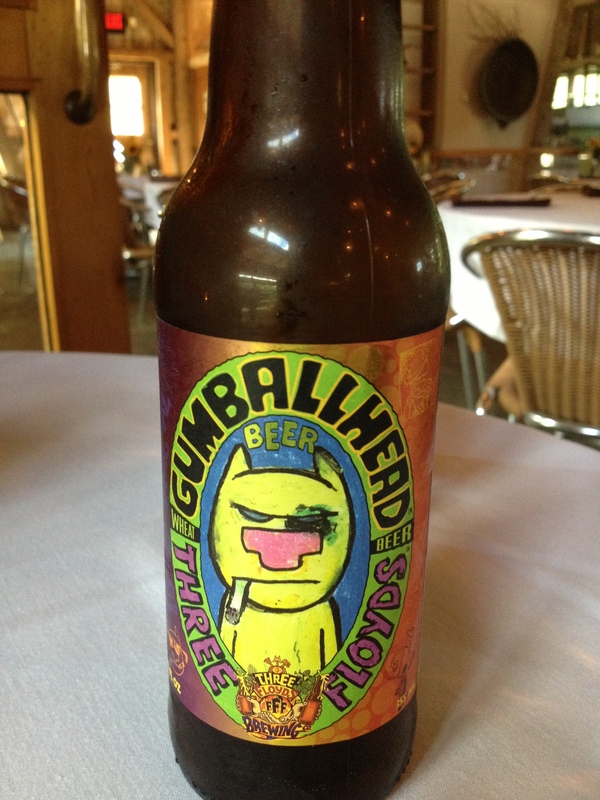 as such, last week we learned of a new favorite sweeping the Hoosier state, Gumball Head Beer from Three Floyds. On the Monday night ride Ken Green among others, raved about the newly discovered brew, which just happens to be sold at Trader’s Point Creamery. To celebrate Deb’s win on Saturday, we went to the Creamery for dinner and toasted with the fine, citrusy, wheat ale. On Sunday B.I.T. 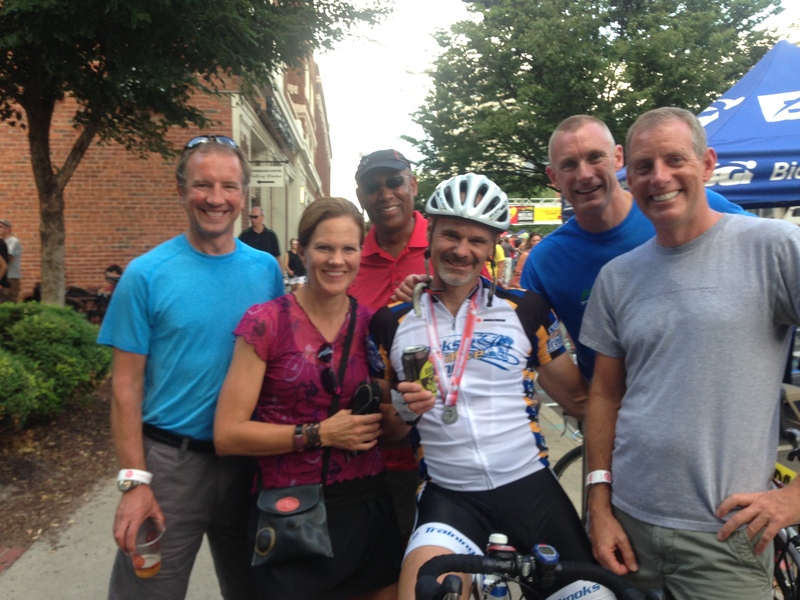 athletes convened downtown for the Tuxedo Brothers Tri Indy, although B.I.T. 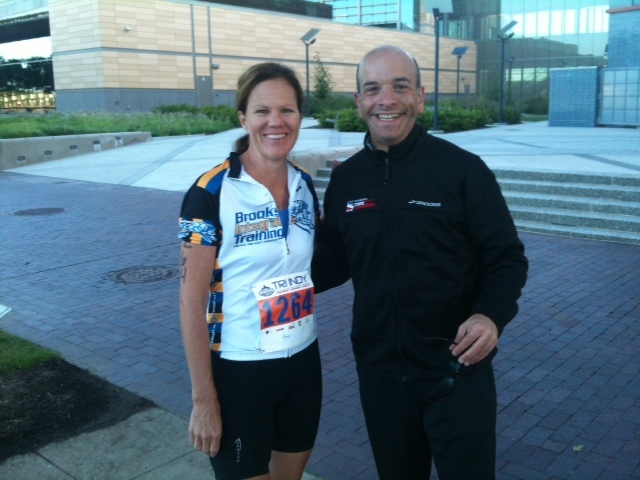 athletes Deb DuBois and Josh Ginsberg skipped the canal swim, opting instead for the duathlon division of this event. Josh has worked extremely hard getting back in shape in 2013, losing nearly 40 pounds since last winter. 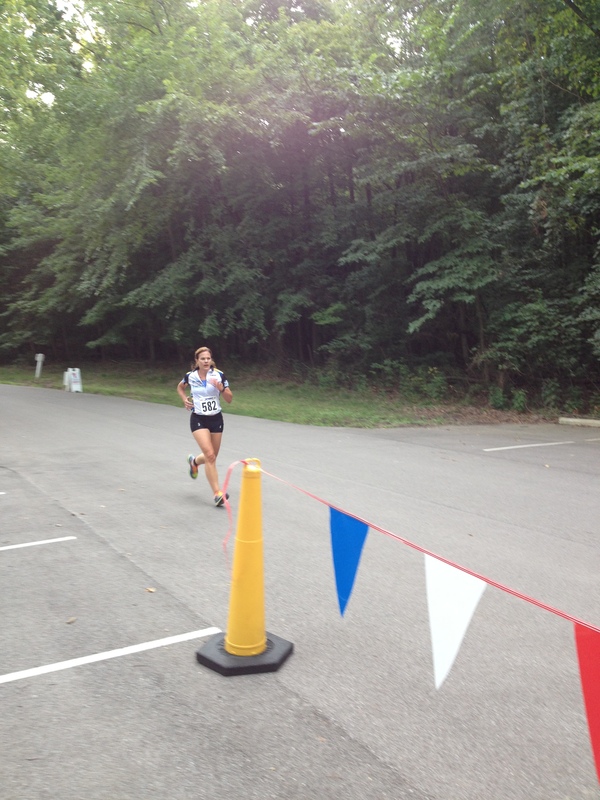 The hard work is paying off; Josh finished 8th overall and 2nd in his age group. Josh’s bike split of 23.0 MPH was 3rd fastest bike leg on the day. Josh credits those 3 hour Sunday trainer rides with B.I.T. for his cycling succceses this season. Nice job Josh!! 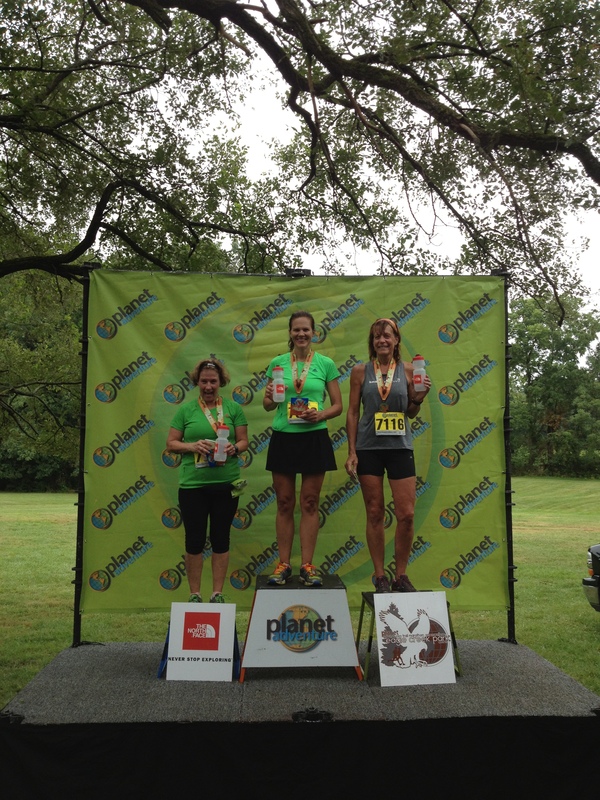 Deb surprised herself with a 2nd in age group and a new PR for the bike split with an average speed of 18.5 mph. Deb again credits the Monday night rides from Fishback as one of the main components of her improvement. 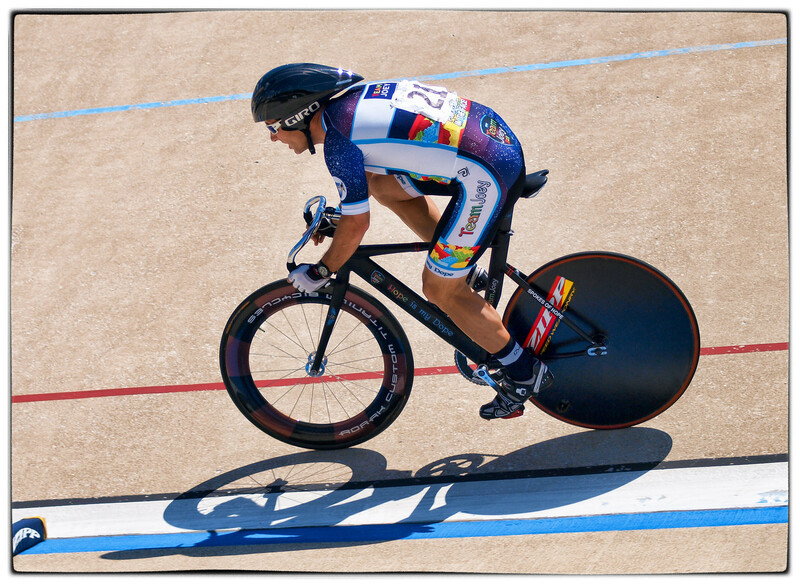 In purely cycling news, Adam Perler competed in the Masters National Track Championships over the weekend. Adam’s first event was the match sprint, a competition that pits two riders against each other for 2 laps of the 333 meter velodrome. The strategy is to outmaneuver your opponent such that you make your opponent lead out the sprint. To do so, riders hold a track stand or pedal as slowly as possible around the steeply banked track for one lap or more, the inside rider trying to hold the outside rider close to the rail at the top of the track. As the riders move slowly around the track on the lap 2, eventually one rider accelerates rapidly down the track. The percentages favor the rider who follows the first accelerator because the 2nd rider gains benefit of the draft before fully opening the jets to sprint in the final straight. However, it doesn’t always work that way as some riders open such a huge gap with their initial burst, that the trailing rider uses all his or her energy in simply closing the gap, leaving nothing left for a final burst in the home stretch. 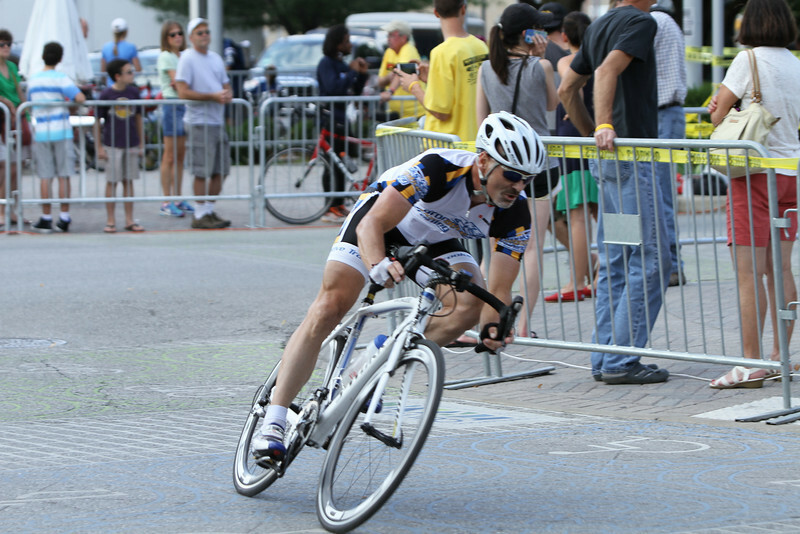 Adam managed to negotiate the qualfying rounds in his age group (35-39) such that he ended up in an odd finale. Four riders took the track to race for one podium spot, 5th place. (National Championships award podium spots to 5 deep rather than the traditional 3). Where normally the event is a one against one, Adam faced three other hungry competitors for that final podium spot. In hopes of surprising his competitors and also hoping they might hesitate, Adam jumped much earlier than in a traditional match sprint, accelerating out of turn 4 at the end of the first lap. Nearly 400 meters is a l-o-n-g way to hold a sprint, but it was worth a surprise attack in the National Championshps. Initially, Adam gained a nice gap, forcing the 2nd rider to work very hard to close the gap, which he did about half way through the back stretch. A strong headwind on said back stretch stymied Adam’s move and thus, the other three passed in Turn 4, leaving Adam to settle for 8th place in his first event. Lessons learned and valuable experience gained leave Adam looking to 2014 with high ambitions. Great job to all the competitors over the weekend.